Like the rest of America, we're crazy about avocado toast but sometimes we get bored with the same old standard. 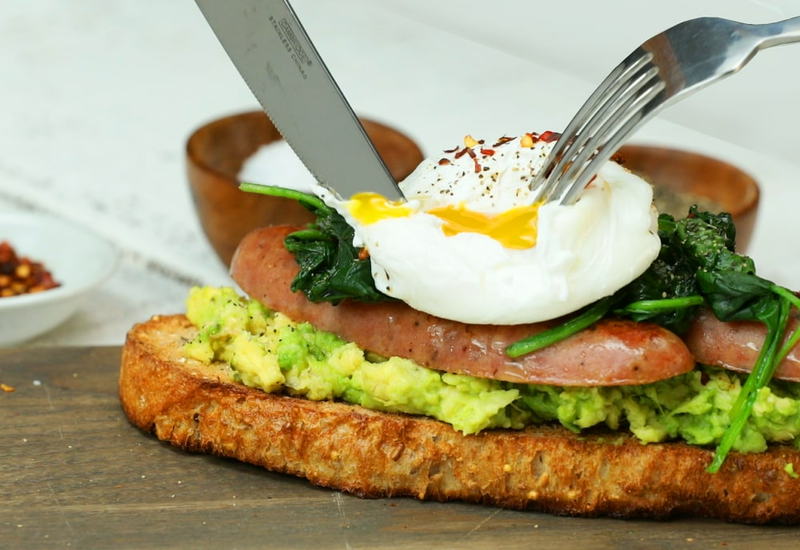 This easy recipe takes regular avo toast and uses it as a base for a much grander open-faced breakfast sandwich. It's topped with juicy chicken sausage, wilted, lemony spinach, and an oozy poached egg. Have one of these and you won't need to worry about getting hungry a couple of hours later. We'll still have love in our hearts for the usual avocado toast but on mornings when we have a bigger appetite, this is the hearty, protein-packed breakfast we'll turn to. This recipe is endlessly adaptable. Don't have spinach? Swap in Swiss chard or kale. Don't have time to poach an egg? Top the toast with a fried egg instead. Not a fan of chicken sausage? Substitute any sausage you like. Or go for bacon. Per Serving: 494 calories; 33g fat; 21.7g carbohydrates; 29g protein; 255mg cholesterol; 1299mg sodium. I freakin' love avocado toast. 4 stars bc it was sooo messy to eat, so I had to use a fork and knife. But OMG the flavors!! I cooked the sausage and spinach in the same pan like the recipe says and this was so easy. The possibilites are really endless when it comes to avocado toast, and this one is a winner. I sometimes struggle with poaching eggs, so I used a fried egg instead. The red pepper flakes gave it the right amount of heat! This is my new favorite weekend brunch meal! This is a breakfast for champs. Also my first time making a poached egg. Perfect for a post morning workout. The sausage link was what won me over for sure! The chicken apple sausages work great in this recipe. I did scrambled eggs for my toast, love it. Definitely have to use rustic bread with this because regular sandwich bread is not sturdy enough, trust me I tried! Love the concept, idea, it was tasty. Next time though I will have to do as the recipe says and use rustic bread.